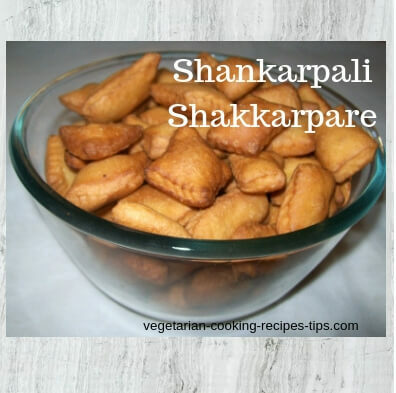 How to make Sweet Shankarpale - shakkarpare - shankarpali. 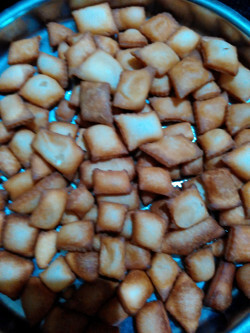 Sweet Shankarpali are prepared mostly for festivals such as Diwali or Christmas. You may also make them at other times as a yummy snack. In Maharashtra, it is known as 'Shankarpale' or 'shankarpali' in Marathi whereas in Hindi speaking places it is known as 'Shakkarpare'. There are different recipes for making sweet shankarpale. This is recipe my mother's recipe and I find it easy to make shankarpali. With this method, shankarpale do not absorb a lot of oil. I will share the other ways of making shankarpare later. Add water/milk and ghee / oil in a wide pan like a kadai. Bring to boil and then switch off the flame. Add sugar and stir till sugar is dissolved completely. Take the kadai off from the stove and keep aside to cool to room temperature. If you are using only water and no milk, you may add sugar to the water and boil it along with ghee/ oil. 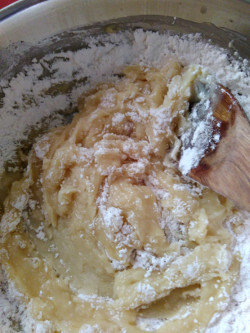 After the mixture has cooled completely, start adding flour/maida a little at a time. We need to make a stiff dough. I am using a wooden spoon to mix as the mixture is very sticky. 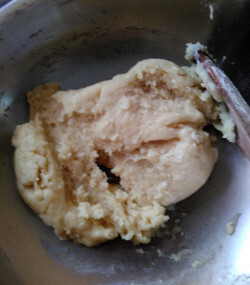 Keep adding flour / maida till all the dough comes together as shown in the picture below. After that you can start kneading with your hand and judge the stickiness of the dough. If it is still sticky, add some more maida. You may add more flour as needed till it is not sticky any more. You should be able to roll it with a rolling pin. 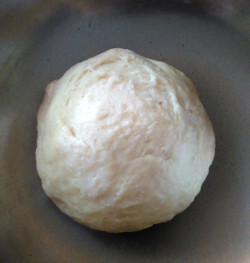 Bring all the dough together into a big ball and keep aside covered for minimum 30-40 minutes. You may keep it for 2-3 hours maximum. 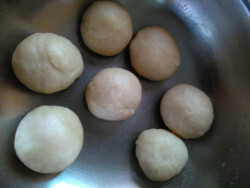 After that time, knead the dough and make balls as shown. You are going to roll each ball and the balls need not be of the same size. Roll each ball into a flat circle. The dough will not stick to your board . So you do not need to sprinkle flour or dip the ball in oil. Cut the circle in diamond or square shapes as shown in the picture. The shape and size is your choice. Half inch or one inch square is ok.
Heat oil. Keep heat medium. Add the cut shankarpale pieces in the oil. these will first sink to the bottom and then rise to the top as they are getting cooked. 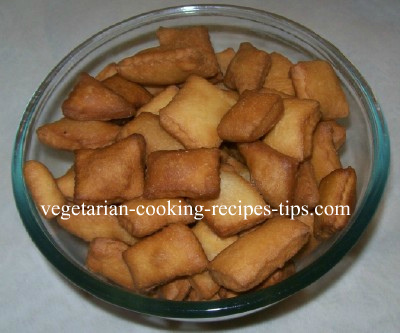 Keep stirring the shankarpale so that they are evenly fried on both the sides. Turn the lighter colored shakkarpare individually so that they are fried properly. Drain and Remove the fried shankarpale on a colander. 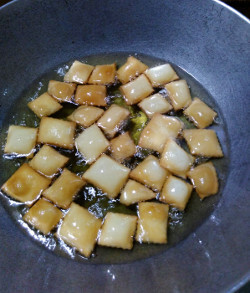 Add the next batch to fry into the hot oil. In this way fry all the shankarpale. You may do the rolling and cutting first if you are doing this alone. 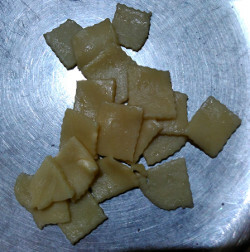 Put the cut shankarpale on a plate and cover them with a wet cloth/napkin so that they do not dry out. Fry them all later, after all the rolling and cutting is done. If someone is there to help you, one person can do rolling and cutting and the other person frying. If you have someone to help you, this becomes easier. One person can do the rolling and cutting and the other can fry. This diwali, my daughter and husband took turns in rolling and cutting and I did the frying. The shankarpale were done in no time. If you are making this for the first time, use a small measure and try it. Shankarpale will keep good for about a month. So you can make them in advance. It is a good tea time snack. Good to pack for picnic or as a gift to someone.